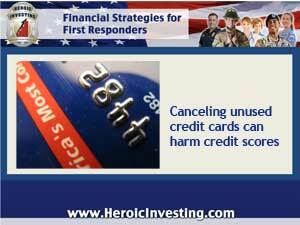 A solid credit score is a must-have for investors, and. as Jason Hartman says, it’s essential to protect that score like the treasure that it is. One way to do that is to cancel those unused credit cards taking up space in your wallet, right? Think again, say financial experts. Getting rid of unused cards may hurt your score more than help it. Credit scoring is a touchy business, with ins and outs known only to the folks at Fair Isaac (more commonly known as FICO) and other credit reporting agencies. And some of the factors that should logically help a credit score can look bad, while others that should compromise it can actually help. According to a recent post from The Motley Fool, many consumers put their scores at risk by failing to consider the “big picture” of how all those cards work together. Closing an account doesn’t eliminate its tracks. Even if it’s been gathering dust, that card remains on a borrower’s permanent credit record for seven years. What’s more, since a long credit history plays a major role in determining credit scores, removing old cards can shorten that history considerably. Since another major factor in credit scoring is the debt to credit balance, even unused lines of credit are counted as available credit against the amount of debt a borrower aerially carries. Eliminating dormant cards can tip the balance unfavorably by reducing the amount of available – even if untouched – credit in relation to credit card debt. But on the other hand, having too many credit cards – more than seven. according to Fair Isaac – also raises red flags. So some prudent pruning of some cards could be helpful – under certain circumstances. All cards aren’t created equal, so to reduce the number of accounts to something more acceptable to FICO, experts suggest starting with store credit cards and special-promotion cards that offer wildly attractive introductory rates or special perks for opening the account. It’s wiser to get rid of newer cards and keep older ones that reflect a long-standing relationship with their issuers. Killing a credit account isn’t as simple as just cutting up the card, or vowing never to sue it again. As long as the account is live, it remains in play – so if the card is lost or stolen, it can be abused. And any fees associated with the account will still accrue. It’s essential to formally close the account with its issuer and get confirmation in writing that the account has been closed –at the request of the cardholder. That way it’s clear that the lender didn’t terminate the account for nonpayment or other credit damaging reasons. Get on the fast track to real estate investing with Jason Hartman’s upcoming Meet the Masters of investing Event in Irvine, CA januar7y 18-19, 2014. Learn more here.